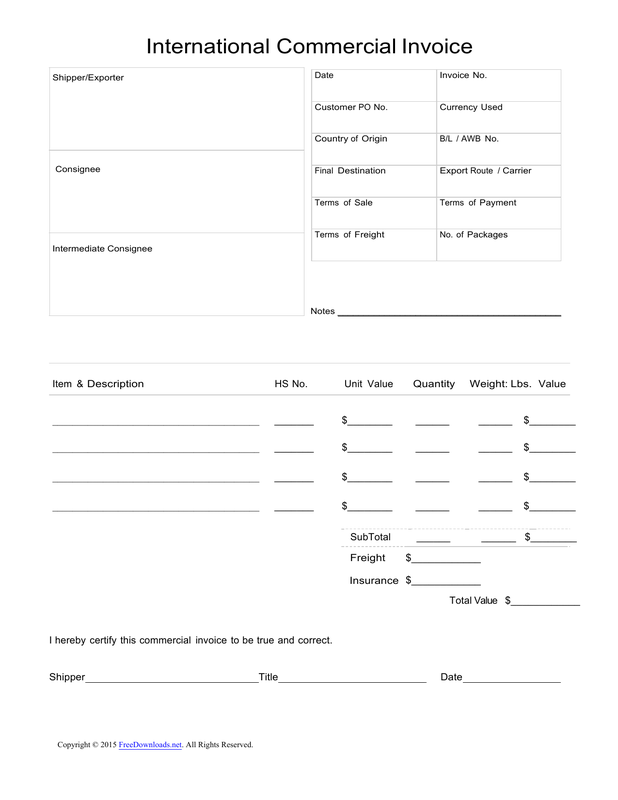 Download a standard commercial invoice template that allows a company to send a package of goods to an international address. The form should contain a brief description of the item along with its quantity, weight, and the purchase price of the goods sold for any country tax or VAT purposes. When placing the form on the package it should be signed by the official sender. Part 1 – Download the Excel Version and enter the following: Date of Export, Terms of Sale, Reference Number, Currency (USD, EURO, CAN, etc. ), Shipper/Exporter, Consignee, Country of Destination, Country of Manufacture, International Airwaybill Number, and the Importer. Part 2 – Write the description of goods including its weight, quantity, unit value, and total value. Part 3 – Calculate the Number (#) of Packages, Sub-total along with the Freight Costs, Insurance Costs, and any Additional Costs to get to the Total. The sender must then sign the invoice after printing and attached to the package for customs and international trade.